Falun Gong practitioners in Hiroshima and Higashi-Hiroshima held a group study and group exercises in Kagamiyama Park on April 16, 2012. 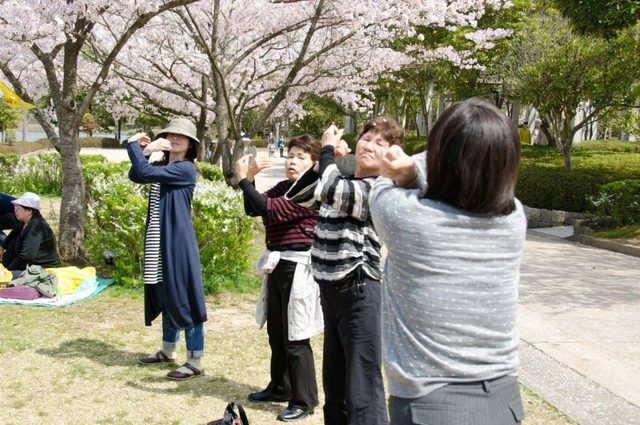 Group exercises in Hiroshima, Japan. 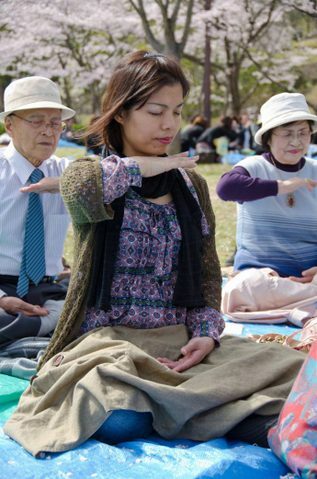 Japanese Falun Gong practitioners do the exercises in a group Mr. Okita in meditation. 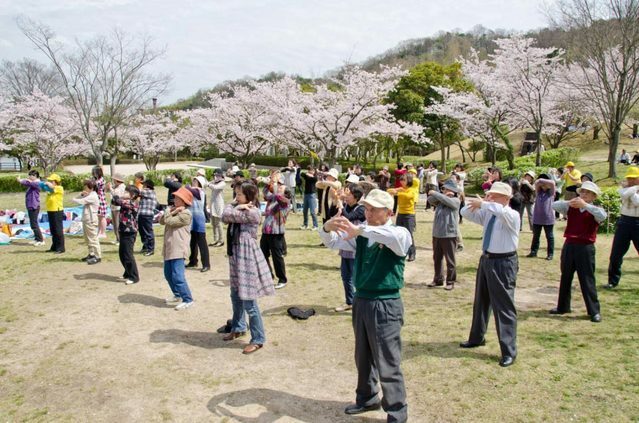 Tourists learn Falun Gong exercises. 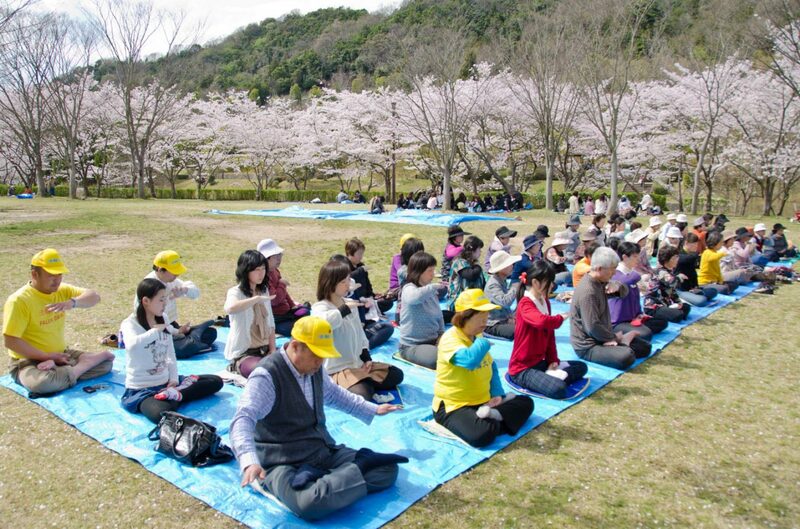 Falun Gong practitioners gathered in Kagamiyama Park around 10 a.m. and studied Zhuan Falun together. Afterwards, they took a group picture in celebration of the upcoming World Falun Dafa Day. There are five Falun Gong group-exercise sites in Higashi-Hiroshima. Most of the practitioners are Japanese. Some started practicing a few months ago, some as long as eleven years ago. 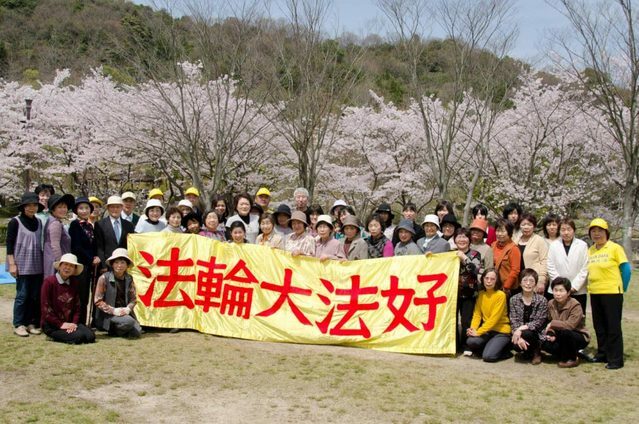 Mr. Igasaki, the organizer of this activity, said the goal of the activity was two-fold: to make collective improvement through experience-sharing, and to introduce the benefits of Falun Dafa to tourists during cherry blossom season. 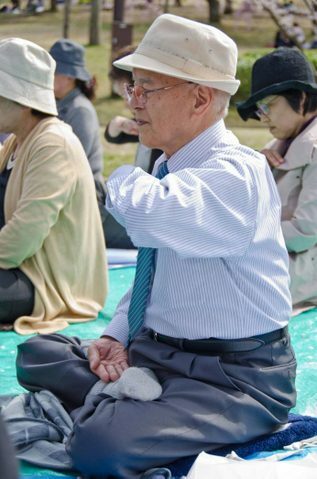 Mr. Okita had been practscing Falun Gong for a year and half and experienced great changes in his health. He used to have a serious back problem and had to go to the hospital every week. However, his symptoms went away after he began practicing Falun Gong. He even looks younger than before. Mr. Okita helped coordinate this activity. Falun Gong practitioners did the exercises together in the afternoon. Their graceful movements created a beautiful scene against cherry blossoms in the bright sunshine. Crowds of tourists continued to come. They stopped to watch the exercises. Some stayed to learn the movements and get more information.